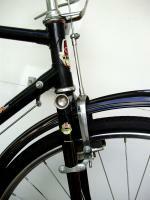 Bicycle Repair Forums - BikeRide › Maintenance & Repair › Cranks & Pedals › Wierd Noise ? Hello guys, I have this problem with my bicycle. Lately, when i start pedaling and driving, I hear some weird noise coming from my cranks, pedals or somewhere near. It's not clicking sound, I can't even describe it with words. If you know what is it, help, if you don't know what sound could it be, I can record it. I just recorded it, here is the sound ! (06-16-2013, 06:13 PM)CroTom Wrote: Hello guys, I have this problem with my bicycle. It is important to isolate the sound. Thats means do not do five things at once. first make sure chain is lubed, test ride. If it is, next step. spray lube on one pedal, test ride. no change proceed to lube the other pedal, test ride, no change. check for movement in crank arms,lateral movement towards the frame and away ,if so Bottom bracket needs serviced, if no movement try to get lube into the bottom bracket spindle area, test ride, if noise changed, service bottom bracket. if not lube Idler pullys in rear, test ride. get the idea? *** Try pedaling one pedal at a time to check if the problem lies with one side ? It's tricky but works. Also , try pedalling out of the seat to check if the noise is affected ? as it could be creaking from a loose / too long seat post. My only other suggestion is to grease any parts where alluminium and steel components meet ! The above posters have assumed that the noise is once per pedal revolution - is this correct? * is the rear wheel centered and tightened properly? * headset/stem/handle bars? - another member found that a once per pedal rev noise was coming from a slightly loose headset.